Acer AL2216W 22" wide TFT screenIt's not often that you find a large viewing space for under Â£150. 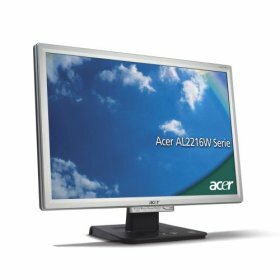 If you are thinking about upgrading for that extra viewing space you can't go wrong with the Acer AL2216W 22" wide TFT screen. Surely it is not one of the best in the market but it does the job well for the budget studio or home PC. The colors are great and the viewing angle is fine for this category. The contrast ratio is good at 700:1 and the 5ms response rate gives a flick free and relaxing eye experience. At 5ms this is not the best monitor but the viewing angles, image quality and screen resolution make the Acer AL2216W a bargain at Â£169.